In this article I will show you how to access SalesForce data to simplify data access and analysis, either in real-time or through a local cache, using SQL commands through the Enzo Unified data virtualization server. Most customers using SalesForce will need to access their data stored in SalesForce tables to run custom reports, or display the information on custom applications. For example, customers may want to build a custom monitoring tool to be notified when certain data changes are detected, while other customers want to keep a local copy of the SalesForce data for performance reasons. You may need to access SalesForce data for a variety of reasons: reports, data synchronization, real-time data access, business orchestrations... Most organizations facing the need to extract SalesForce data are looking for a way to get real-time data access into SalesForce, or access a local copy of the data for faster processing. Enzo Unified is a data virtualization server that gives you the ability to access SalesForce data in real-time, or automatically cached locally, either through SQL or REST commands. A virtual table provides a view into a SalesForce object. The virtual table doesn’t actually store any data; it provides a simple way to get to the data through REST and/or native SQL requests. A snapshot is created on top of a Virtual Table. 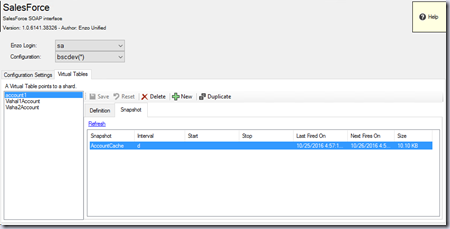 Snapshots create a local copy of the underlying SalesForce data and make the data available to both REST and SQL requests. Snapshots buffer the data locally inside Enzo Unified, which provides a significant performance boost when querying data. Snapshots can be configured to be refreshed periodically. When SalesForce data needs to be copied to an external system, such as SQL Server or SharePoint, Enzo Unified provides an Integration adapter that is designed to copy data changes to a destination. For example, with the Integration adapter, Enzo Unified can detect changes to an Account table in SalesForce and replicate changes made to that table in near-time to a SalesForce list. The Integration adapter will be covered in a future article. For a broader overview of Enzo Unified, read this whitepaper. For a brief justification for this technology, see this article. Let’s first create a Virtual Table in our SalesForce adapter; the virtual table is called Account1, and points to the Account table in SalesForce. Note that the adapter is already configured with my SalesForce credentials. SalesForce credentials are assigned to a Enzo login; in the example below, the credentials to connect to my SalesForce environment is attached to the ‘sa’ account in Enzo. Because multiple configuration settings can be saved, they are named; I am showing you the ‘bscdev’ configuration, and the (*) next to it means that it’s the default setting for this login. To create a virtual table, let’s select the Virtual Tables tab. A virtual table in SalesForce is defined by a SOQL definition, which Enzo Unified runs behind the scenes to fetch the data. 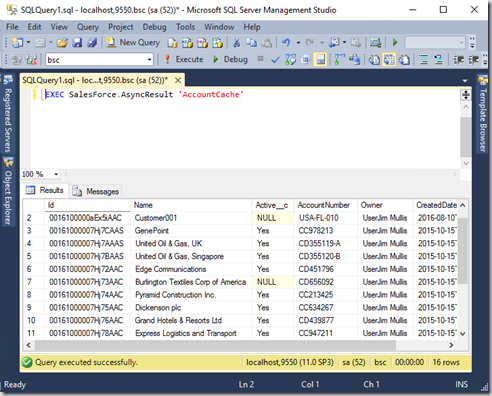 Clicking on the ellipses next to the SOQL statement allows you to edit the command. The edit window allows you to test your SOQL command. The columns of the virtual table are automatically created for you based on the command you specified. Once the virtual table is created, retrieving data from the Account table is as simple as running this command: SELECT * FROM SalesForce.Account1 – this executes the SOQL command against SalesForce behind the scenes, and once the data has been fetched it is returned to you. You might wonder… where do I run this command from? 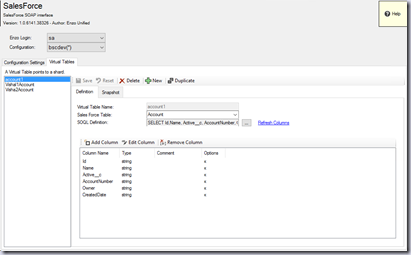 Since Enzo Unified is a data virtualization server, that understands native SQL Server requests, you can use SQL Server Management Studio (SSMS) to connect to Enzo Unified directly. 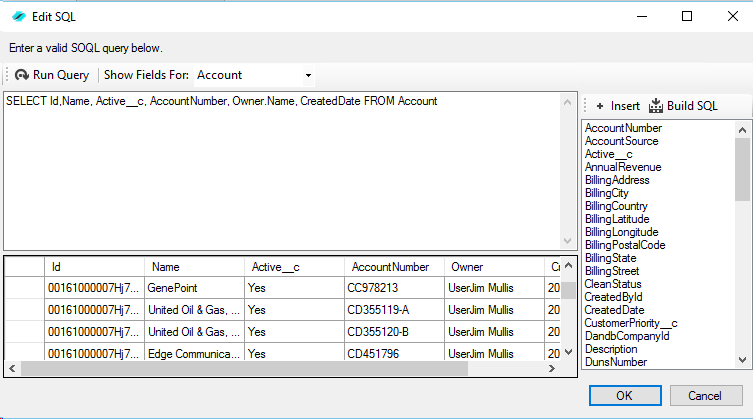 Or you can use Excel, and connect to Enzo Unified as a SQL Server database. 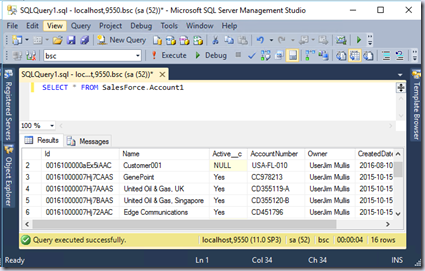 Or you could use ADO.NET from a .NET application for example, and declare a SqlConnection that points to Enzo Unified. 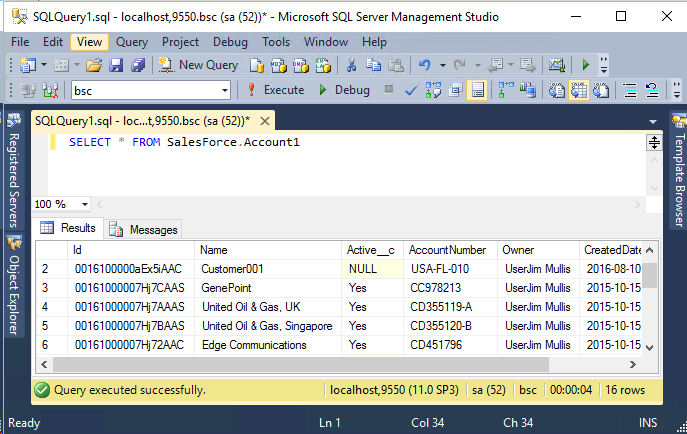 For example, here is the command executed from SSMS; the data came back live from SalesForce. 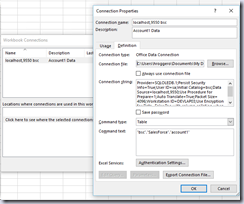 And here is the data using Excel 2013, with the Connection Properties to Enzo Unified. 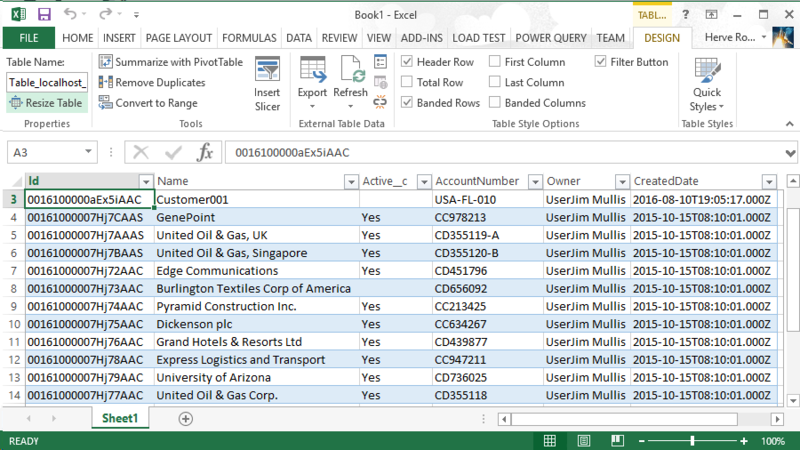 As you can see, Excel sees the Account1 virtual table and is able to read directly from it. 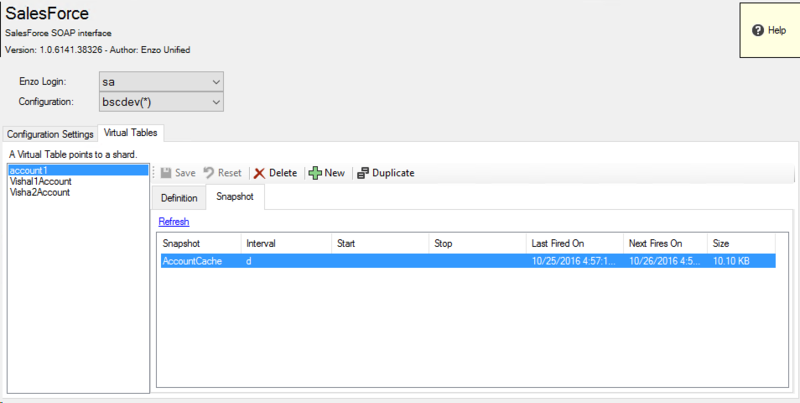 As described previously, a snapshot is a local copy of the data and kept in Enzo Unified for faster retrieval. 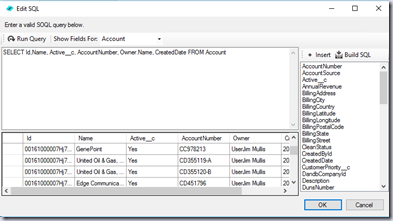 This allows you to create a simple local cache of remote data; in this case we will store the SalesForce account table in a Snapshot called AccountCache. The Snapshot is defined on the Account1 virtual table. 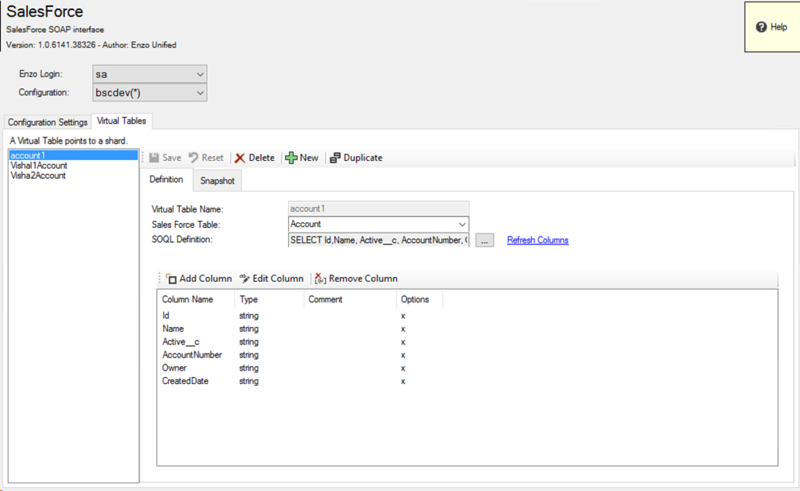 Using Enzo Manager, select the Account1 virtual table (in the SalesForce adapter), and select the Snapshot tab. The Snapshot below shows that it is refreshed daily; note that you can enter a Cron schedule to refresh the Snapshot at specific intervals. The main difference is that the data is now coming from a local cache instead of the SalesForce Account table directly. As a result, the data may be somewhat delayed; however since the Snapshot offers a schedule for data refresh, you have control over how old the data is. 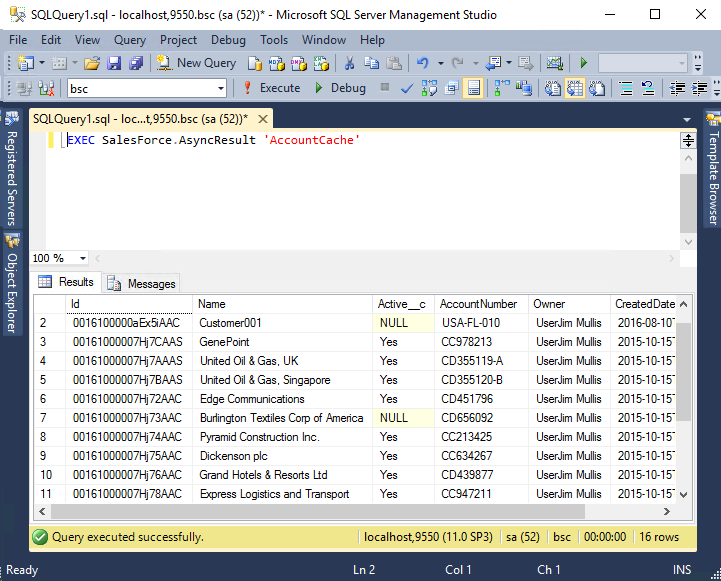 You can also access the Snapshot data from code using ADO.NET. The following code shows you how (note the EXEC call to the AsyncResult object). 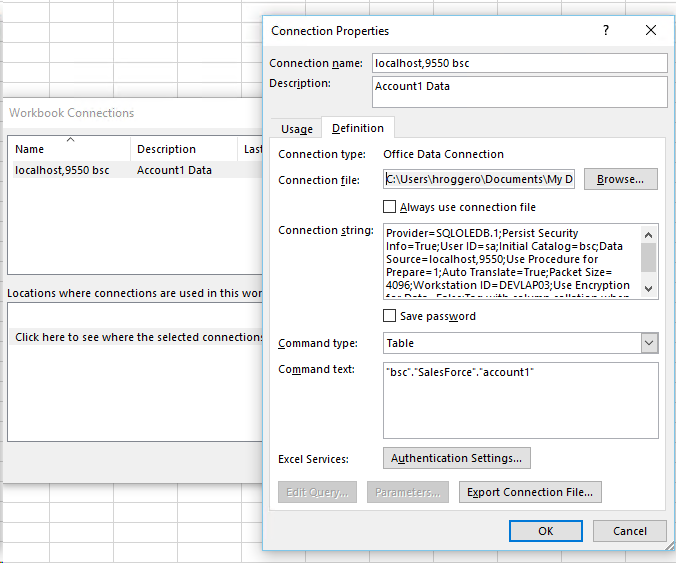 This article shows you how to access SalesForce data using native SQL commands through Enzo Unified, using various tools and techniques, including Excel, SSMS and .NET code. Because Enzo Unified is a data virtualization server that understands native SQL and REST commands, anyone with the proper access rights can access SalesForce data without learning the underlying APIs. And as with most data virtualization platforms, Enzo Unified offers security options giving you the ability to control who can access which virtual tables and snapshots.